In October 2017 I happened to be lucky enough to be able to do something that could take about 2 years to get authorized. 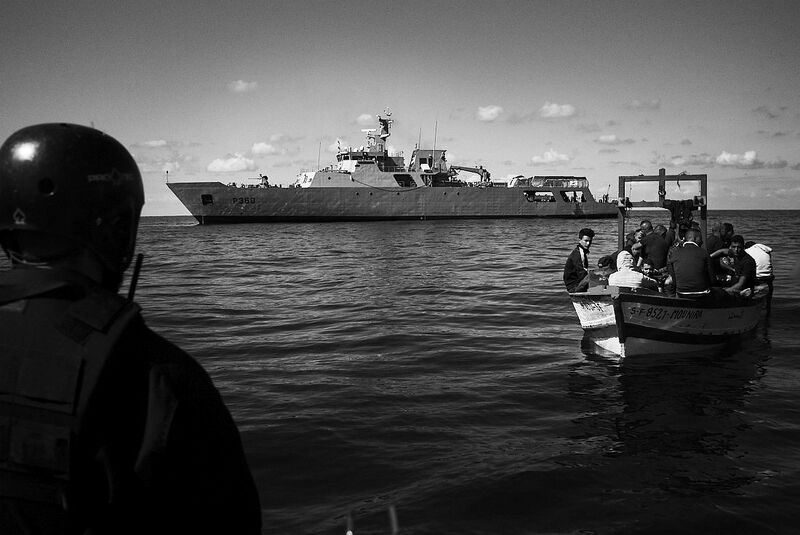 I boarded a Portuguese navy vessel for a month to provide full coverage of the Frontex – Triton mission. Today, despite having learned so much, I know less than I thought I knew before I went; now I miss the difference between refugees and migrants. I have witnessed humanity and inhumanity. The expressions in their faces, made me know that saving people is the only thing that matters, even when their fate is uncertain. The “refugrants” – the word does not exist yet, but perhaps we can begin to think of a new word that can describe the uncertain ones adrift. Are they refugees or illegal migrants? The concept begins to dilute in the waters of the central Mediterranean Sea, when they appear in small makeshift wooden boats, with no much food, no much water, no much luck, but only hope. For a month, this military ship patrolled the Mediterranean Sea. Took more than half a thousand hours to do 5000 nautical miles in the area of operations, between Lampedusa and Tunisia, in search of these people who go to sea usually at dawn and sail for hours if they have the good fortune to hit the course, or days, if they lose the north. The shock of the military grey with the warm human reception, sketches traces of tranquility and demilitarises an action that has everything to be fearful at the beginning. They feel saved, in the end, they feel saved. From the beginning of 2017 until the end of October, more than 100 thousand migrants have been rescued. 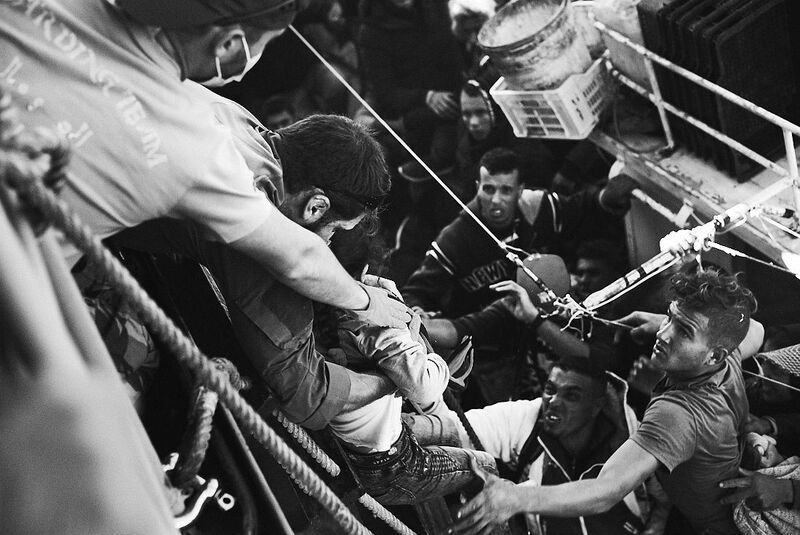 Frontex confirms a number of deaths exceeding 240, this year. Rui Caria was born in Nazaré in 1972. His career in the image area began in 1990, making small commercial movies. In 1993, he became correspondent for a national television channel, TVI, where he remained as a camera news reporter and editor until 2003. In 2005, he moved to Terceira Island in the Azores, where he began teaching media courses in Professional School of Praia da Vitória. He’s a reporter and correspondent image editor in the Azores region for a main national TV channel, SIC, since 2006. He collaborates as a photojournalist with several national and international newspapers. His photographic work is internationally recognized by the editors of major photo sites such as National Geographic, 500px, 1x, Leica Fotografie International, Getty Images, among others. ‘The refugrants’ was the Black & White Photojournalism Series of the Year 2018 Winner in the MonoVisions Photography Awards. 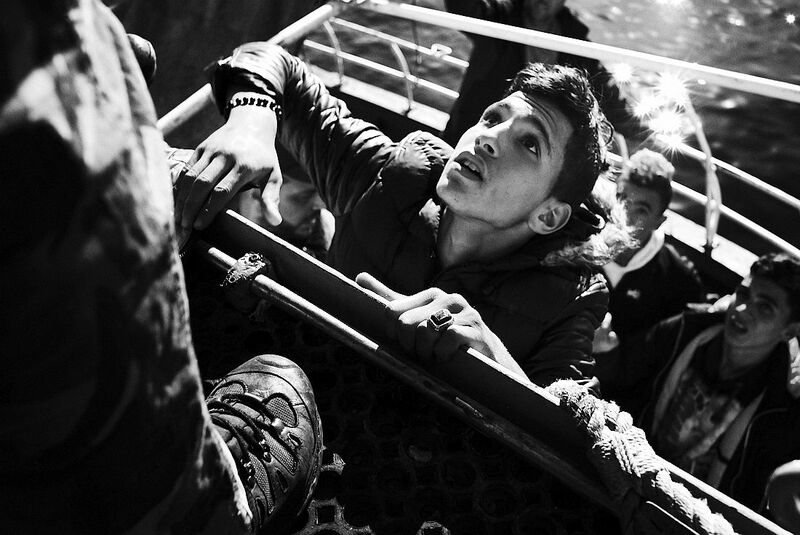 Young boy climbs aboard the Portuguese military ship. Although it does not have more than one backpack, fashion accessories are present. The expression of awe mixed with fear appears on almost every face, especially the younger ones. 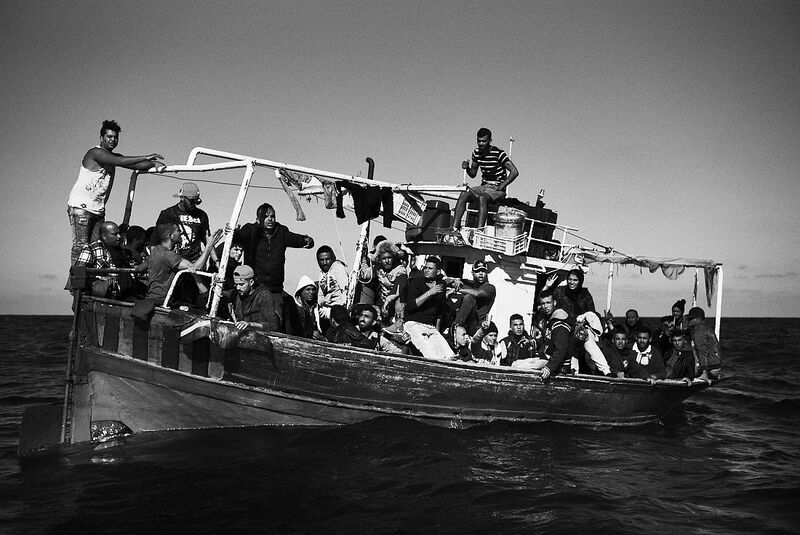 Boat with 48 illegal migrants from Tunisia. The military engineers who checked the engine of this boat, found that it could not stand much longer, was too hot and poured oil and fuel. Mediterranean Sea, 27.10.2017. These boats come to cost more than 50,000 euros and some are paid by all who come on board. 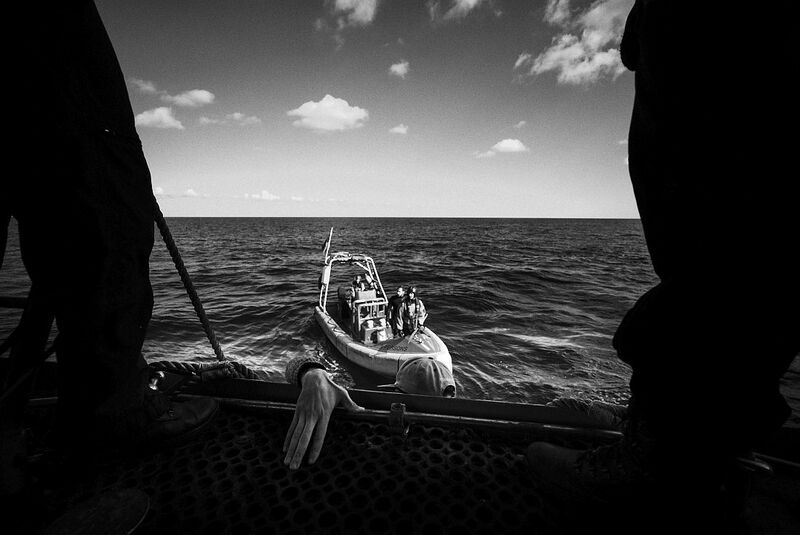 A little girl is passed from the boat of migrants to a Portuguese marine on the vessel. This was the second attempt. When children or women are detected aboard these migrant boats, all procedures are more anxious and stressful for the Portuguese military. Portuguese marines in action approaching a boat of Tunisian migrants in international waters in the Mediterranean Sea, 14.10.2017. The Portuguese Marines boarding team is essential to deter the migrants, detain them and take them aboard the Portuguese navy ship. It was never necessary to use force. 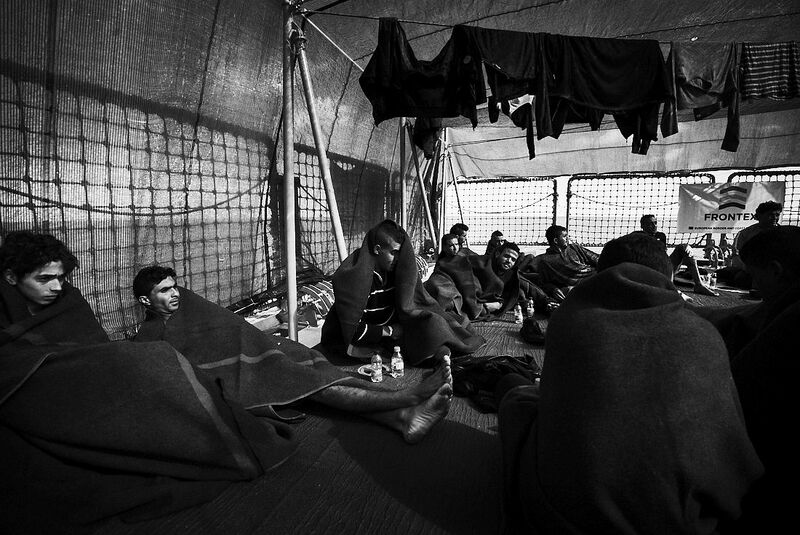 During the journey to the port of Pozzalo, on Sicily Island, Italy, the men rescued from the sea rest on the flight deck. Mediterranean Sea, 15.10.2017. It is almost a day trip to the Italian port that will receive them and although the conditions are not ideal, they are much better than what they would have if they had stayed on their boats. 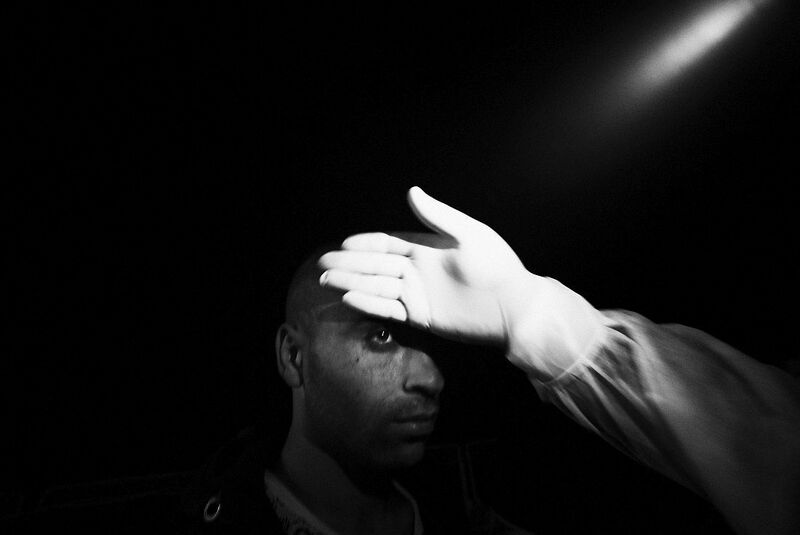 Man being consulted by the Portuguese navy doctor on board, at night. Mediterranean Sea, 17.10.2017. The doctor and the nurse on board examine all migrants looking for common diseases. 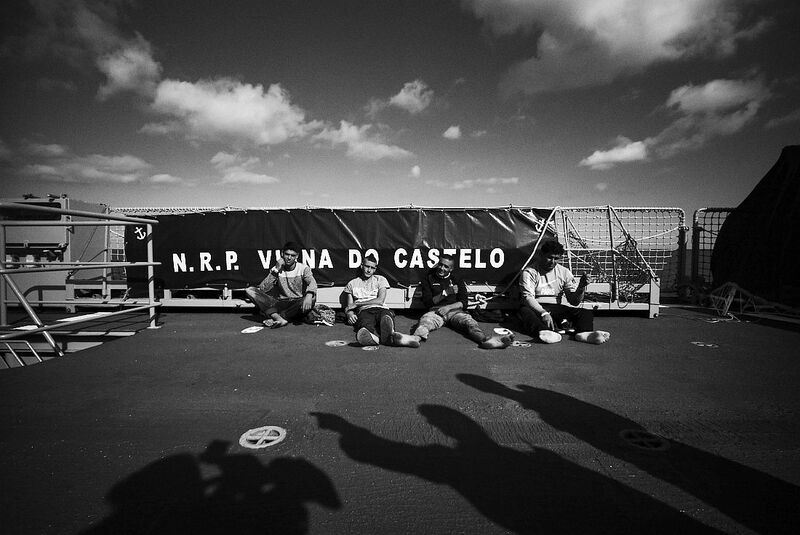 Men sitting in the flight deck of the military ship, Viana do Castelo, waiting their turn to be checked by the agents of the foreigners and border service. Mediterranean Sea, 15.10.2017. All migrants collected on board are subject to scrutiny by agents of the Portuguese authorities on board, as they have no documents, the registration is done based on the names that they claim to have. The hand clings like a claw to the ship’s structure. They climb one by one always aided by the crew. Mediterranean Sea 15.10.2017. Although in the beginning these people do not want to be saved, because they prefer to reach the land by their means, they feel that they will be safe from that moment.